March ushers in the onset of spring and the return of the tulip. Simple in bloom and bold in color, the tulip is one of the world’s most popular and most recognizable flower. Their distinctive shape makes for a stunning table display when grouped alone or combined with any other flower. They also create a manificent fresh-cut bouquet sure to deliver happiness to each recipient. Tulips are unique in the fact that they bend, twist, and turn toward a light source – appearing to waltz to and fro in their vase. Every day, tulips have a different look and make for an ever-changing display! With nearly 110 varieties, tulips are grown in gardens, used as potted plants, or as fresh-cut flowers. They are stunning when displayed on their own or paired with a variety of other fresh flowers. They are the perfect gift to celebrate birthdays, congratulations, new baby, or send to family and friends. Besides the dahlia, tulips come in more colors than any other flower. 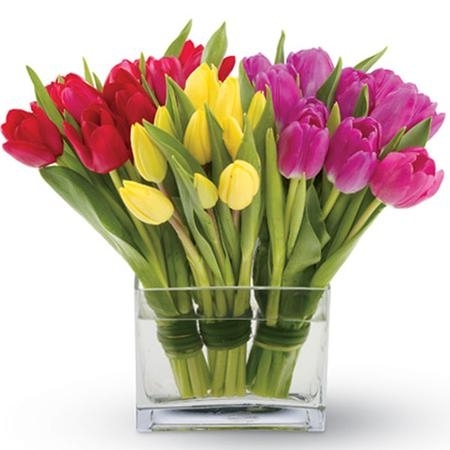 Give the gift of farm-fresh tulips from Carithers Flowers and deliver a taste of spring anytime! Call Carithers Flowers at (404) 418-7443 or go to www.carithers.com today to place your Holland Tulips order. Carithers Flowers offers same-day deliver in the metro-Atlanta area including Acworth, Alpharetta, Austell, Buckhead, Canton, Conyers, Decatur, Duluth, Dunwoody, Kennesaw, Lawrenceville, Marietta, Norcross, Roswell, Sandy Springs, Smyrna, Stone Mt, Tucker, Woodstock. Follow Carithers Flowers Twitter and receive 10 % off your order using the special Twitter promo code.